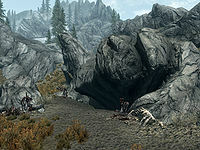 Orotheim is a small cave that is home to bandits intent on poaching mammoths. There is only one zone to the cave, Orotheim. The cave is northeast of Rorikstead, past Talking Stone Camp, on the cliffs above Crabber's Shanty. Bandit AttackHF: Rescue your beloved from kidnappers. There is a rough path running northwest from the White River, that curls around the edge of the mountain to the entrance. There are a number of bear traps in the undergrowth around the cave and grisly stakes with corpses speared through their stomachs either side of the entrance. There is an iron ore vein among the rocks above the entrance to the cave. The cave is split into three rough rooms. Just behind where you enter there is a lavender plant, then along the walls of the tunnel there are several types of fungi; three fly amanita fungi, a bleeding crown fungus, an imp stool, and a Namira's rot, as well as another lavender. The first room is inhabited by two bandits; one on the ground level, and another on the wooden platform above, usually using the smithing equipment. Around the edges of the room are four imp stool, two fly amanita, a bleeding crown and a Namira's rot fungi. There is a cooking spit above the campfire, and a mammoth snout, and two mammoth cheese bowls on the table. There is also a pickaxe in the middle of the room. On the platform there is a table with some empty wine bottles and a random potion of healing. To the right are some boxes and sacks of food, on top of which is a copy of the One-handed skill book Mace Etiquette. Past that there is an anvil, a grindstone, and a weapon rack with an iron war axe, an iron mace, and a random sword. There is a ledge to the right of the grindstone where two imp stools and two bleeding crowns are growing. Along the short tunnel to the next room there are two imp stool fungi, two fly amanita fungi, and a lavender plant. On the ledge high up on the right of the tunnel, another fly amanita and a white cap are growing. The tunnel opens on a wooden platform where a bandit alternates between leaning on a table to the left, and using a tanning rack. Two bandits are located in the lower part of the room, one of whom is the bandit leader. The bandit leader carries a journal describing the reason behind setting up camp in the cave. Around the campfire are four hay piles. By the wooden platform is a table with two chairs and a satchel, a bottle of ale and a bottle of alto wine, and behind that, under the platform, is a random soul gem, a random pair of boots and an apprentice-locked chest. Around the room are a lot more patches of fungi; there are five imp stool, four bleeding crown, three fly amanita, two blisterwort, and a Namira's rot. Through the tunnel to the southwest, where a rather pointless bone chime hangs, is the treasure room. To the right is a table with a leveled weapon, an iron war axe, a satchel, a random potion and several bottles of wine and ale. Straight ahead is an unlocked chest. Opposite the chest are a stack of crates with a random pair of boots among them. To the south is a torch, and to the right of that is a pull chain that lowers a portion of the wall above the very first room. Through the treasure room and the ledge above the first room are more ingredients; three imp stool, two fly amanita, and two Namira's rot. While Orotheim does not have a large amount of a single fungus or plant, it does have a large amount of alchemical ingredients in total, especially considering its relative size. It includes 17 imp stool, 13 fly amanita, 8 bleeding crown, 5 Namira's rot, 3 lavender, 2 blisterwort, and 1 white cap. The iron ore vein above the entrance may not be able to be interacted with ?